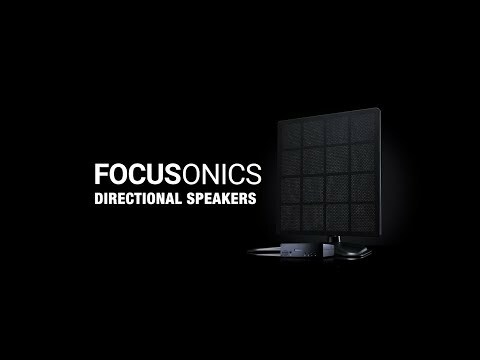 VILNIUS, Lithuania, April 9, 2019 /PRNewswire/ -- Neurotechnology today announced the launch of its new parametric array speaker, Focusonics Model A. Unlike conventional speakers that spread sound evenly, the Focusonics speaker uses ultrasonic waves to generate a directional sound that is confined to a narrow beam. The Focusonics speaker is ideal for use in a variety of situations where sound reproduction needs to be localized to a certain area while quiet is maintained elsewhere – from promotions in retail showrooms, galleries and trade shows to targeted public address and warning systems. Focusonics is a directional speaker that uses ultrasonic waves for sound reproduction, generating sound that is confined to a narrow beam; in the beam, the listener is immersed in music or speech while just steps away no sound can be heard. The beam of the Focusonics speaker attenuates very little with distance and can be used to attract the attention of people from a significant interval away. For example, the speaker can be used to inform people at security checkpoints about what to remove from their luggage or transmit warning messages specifically to people who cross the safety line on a train platform.